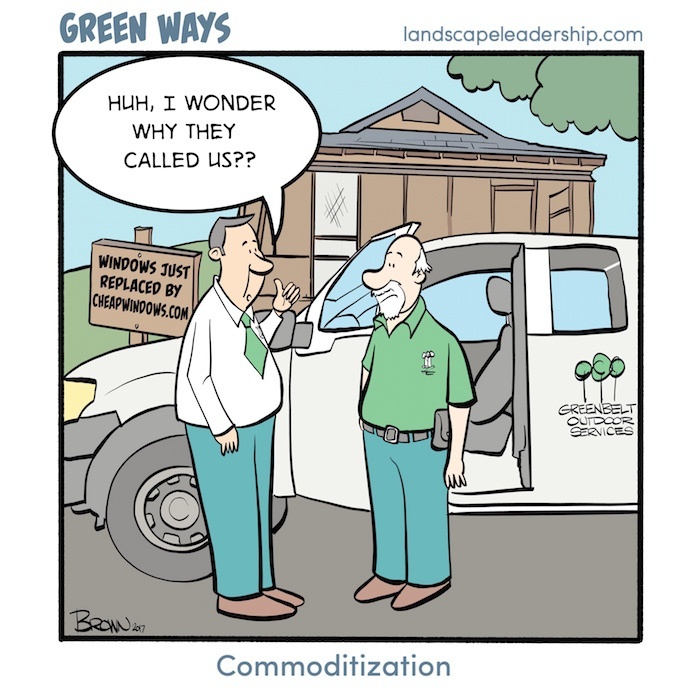 I've been contemplating the process of commoditization and why it plays out in the lawn and landscape industry. This outside perception of commoditized offerings is destructive. It's most visible on your bottom line with a net profitability that is unable to fuel consistent business growth. "The underlying process where customers and prospects systematically eliminate everything that businesses believe is different or special about their offerings, reducing those businesses to their lowest common denominator, which is typically (but not always) price." These are my current insights as to why I believe this destructive force is rampant in our industry. First, commoditization thrives in a marketplace that accepts mediocrity. Let's be truthful with each other: You are operating in such a marketplace. The majority of consumers in this country are willing to accept mediocrity when it comes to investing in their backyards, businesses, HOAs, etc. They won't tell you this, of course, but their actions (i.e.- spending, contractor selection, etc.) will suggest otherwise. This point is mostly out of your control. Next, too many of you lack the courage and/or discipline to consistently walk away from bad-fit clients. You have the right to say "no", just as your prospects and customers do. You don't exercise it enough. Closely related to this is the problem of underpricing and over-servicing. You say "yes" to a project or client you shouldn't, you underprice it, then you provide more than what was contracted. You're creating a hot mess for yourself. And every time you step in it your net profit drops. I hate to say it, friends, but this describes our space, the lawn and landscape industry. We're on a treadmill of "sameness". 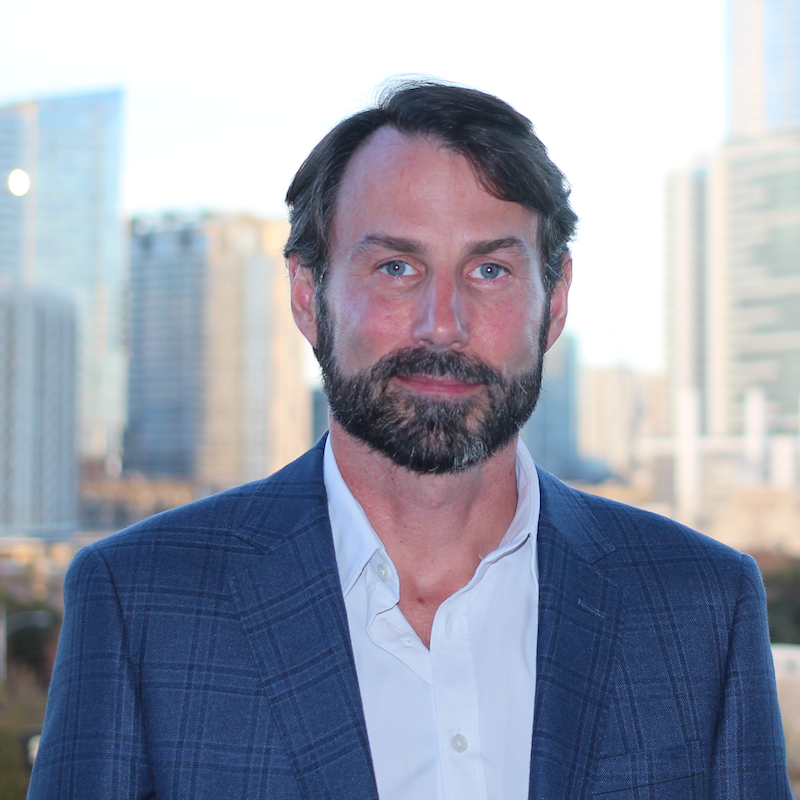 You're not spending enough time going outside the industry for fresh insight and perspective that can really ignite innovation within your company. Instead, it's stale conferences and speakers, and more peer groups and facility tours. Insider "Group Think" doesn't inspire innovation – it waters it down. Finally, companies do a poor job positioning themselves. In other words, you do an insufficient job distinguishing yourselves from your competitors – in the mind of your prospects and customers. "...customers and prospects systematically eliminate everything that businesses believe is different or special about their offerings." These are the cliches I see splashed all over your websites. Your prospects and customers don't feel the same way. They don't see traits like these as being "special" or as a way to differentiate between contractors. That's why they quickly eliminate these traits from consideration and reduce you to your lowest common denominator, which is price. In my estimation, this is why your services have become commoditized. You don't say "no" to bad-fit clients, then, in addition to that, you underprice and over-service your clients. You are copying your competitors and peers too often. Innovation gets watered down. Your positioning and messaging is weak, so you are unable to differentiate yourself from your competitors. Each of the above points is compounded because the majority of consumers accept mediocrity when it comes to their landscapes. Is there a way out of this destructive spiral? Of course, but it is a painful process that many of you might not have the stomach for. It will take courage and discipline to settle on and sharpen your positioning so your company is viewed as unique and irreplaceable. When you change this perception then you can charge a higher price. A healthier bottom line will make it a helluva lot easier to say "no" to the wrong clients. It will also require you to step outside the comfort of your own industry to seek fresh insight. Ready to give up a little of your comfort for more business growth? If you are an owner who is ready to make some courageous and painful business decisions, then we want to talk to you. We'll help you get clear on what you do, who you do it for, how to find them, and what to say to them. That's the power of positioning. Get started by requesting a meeting here.